Can Acupuncture Treat the Flu? Through acupuncture you will see benefits not just physically, but emotionally and mentally as well. 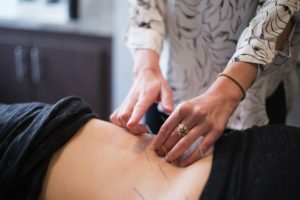 Acupuncture can be used to treat back/neck pain, headaches, fertility, digestive conditions, allergies, improved immune system, and so much more. As we head into flu season…YES it is nearly here, let’s take a look at all the ways we can help prevent the flu, and reduce the symptoms and duration. At the core of Acupuncture is the notion that a type of energy known as Qi (pronounced “chee”), flows through energy pathways in the body. Each pathway corresponds to one organ, or group of organs, that manages particular body functions. Achieving the proper flow of Qi is thought to create health and wellness. It boosts the immune system’s production of natural killer cells for up to 3 days after each treatment. • EAT RIGHT – Eat warm foods, soups, stews, roasted veggies. Avoid eating cold foods, yogurt, smoothies, salads. • Dress Warm – Keep your head and neck covered, keep your core warm. • Get Acupuncture – Regular acupuncture treatments help support and strengthen immunity. It can provide immediate relief, and reduce the length of infection. • Get regular chiro adjustments – Did you know that those who have regular chiro adjustments will have a 200% greater immune competence? Fall is not the time to skip your appointments! Remember, the sooner you treat it the better!